Mindwipe is one of those Decepticons that you absolutely do not want to get anywhere near your sensor range, and with good reason: he is one of the scariest bots alive… and he does it all without even showing his faceplate. He is telepathic. Not only can Mindwipe use it to scan Autobots’ minds from miles away to learn their plans without infiltrating their ranks, but he can implant aggressive virus routines that will enslave them uncontrollably to his will. He infamously attempted to infiltrate Optimus Prime one time, but was resisted for the first time because of the Autobot leader’s influence from the legendary Matrix of Leadership. No matter, he still has thousands of mindless zombie-bots under his influence to wreak havoc for him. Sometimes, Mindwipe likes to break the monotonous routine of hiding and commanding from afar by landing and bringing the pain with his dual high-frequency switchblades and energon-draining wing spikes. Mindwipe’s vehicle mode is based on the real Lockheed Martin F-117A Nighthawk first-generation stealth fighter-bomber. The three landing gear struts can all be extended and retracted. The forward landing gear is actually composed of two halves, but they can move into the same positions. The main gimmick for all of the fully-transformable figures from the 2007 “Transformers” toy line was Automorph Technology™: as one part of the toy was being moved, another section would activate and move by itself via internal gears, springs, and levers. (Usually this applied only going in one direction for transformation but not the other.) For the 2009 “Transformers- Revenge of the Fallen” toy line, the Automorph feature has been replaced with Mech Alive, which is not involved in transforming the toys. Rather, it is a gimmick that functions only in robot mode to better imitate, in some fashion, the intricate movements and mechanics of the immensely more complex CGI character(s). Some figures are being reissued from the 2007 line, since no significant changes were made to the character in that time-span, and will still include their original Automorph feature, but not the newer Mech Alive feature because they were manufactured two years previously. When folded backwards, each wing will sprout two red spikes across the trailing edge, the wingtips will curl further backwards, and a pair of red gears along their undersides will spin. The process automatically resets itself when converting back to Vehicle Mode. Though Mindwipe’s three silver painted eyes are hidden behind transparent red plastic, there is no functional light-piping. Due to how it transforms, his neck is articulated enough that he can lean his head backwards for flying poses! A pair of switchblades can be deployed from under his forearms. They spring forward when triggers on the inner sides of the forearms are depressed. It... is... [censored]... AWESOME!!! The aura this guy puts out is downright creepy in either mode. First of all, I’m a fan of real stealth vehicles like the Nighthawk, so that was a good button to push. Second, the choice of a stealth vehicle allows for many of the alt mode’s curves to be eliminated when transformed into robot mode, and for a toy of a Bayformer, that can mean a lot. Third, having flip-out knives is cool, but to have them hang downwards like giant fangs under his arms is both daring and awesome even though it eliminates the option of repositioning them, and neutralizing posability in the wrists. Fourth, the wings and V-tail from vehicle mode are well integrated into robot mode, rather than staying whole and simply sitting on his back like most fixed-wing Transformers are prone to. He doesn’t have devil wings, but the way they curl around and actually (automatically) deploy new spikes is awesome! Fifth, when a transformer has a triple-jointed bird leg, it’s pretty obvious what it is, and they are prone to falling over easily. This guy not only has long feet with a limited ankle joint that allows them to ratchet inwards a little for a better grip when his legs are splayed, but I’ll bet you didn’t even realize that he had bird legs until I said something, did ’cha? Sixth, posebility in all areas, except for forward movement at the hips, is awesome. even with the wing kibble on his arms and back, including a waist joint and double-jointed neck. Seventh, this bot comes across like a Cybertronian gargoyle: dark, moody, ready to spring at a moment’s notice, self-sustaining, demonic, and intimidating all at the same time. In fact, there was only one low point after I pulled him out of the box… The instructions say that the entire upper half of the airplane just flips over 180-degrees, but they’re not clear as to what moves and what doesn’t! I spent about seven minutes trying to determine what panels moved, where I could hang on to him as I moved the parts, and how much force was too much. It wasn’t until I unintentionally bent the main wings downward slightly that it all flipped upwards suddenly. You might want to mention that next time, Hasbro. Lack of paint is not an issue with this toy as all the surface details are flawless. And the best part? Both kids and adult will dig this toy, and it's not a cheap Deluxe-class figure. Voyager-class Decepticon Mindwipe is an amazing design that you keep wanting to pick up again and again, and he should not be passed over at any time. Highly recommended! Here's one little bit of info that the directions don't tell you: Skystalker connects to Mindwipe! How? there are pegs at the bottom of Skystalker and he connects to Mindwipe on top. Correction... less CRAPPY & CHEEZY alien like. I totally agree: awesome figure! It's one of the few where the bio actually helps the figure's awesomeness. I haven't seen a bip really bring character to a figure in a long time. The Little autobot sticker, is part of Hasbro's Mail Away special deal. Collect, I think its, 3 of these stickers, along with the Mail in form that comes in the Infiltration Bumblebee vs Soundwave 2 pack, and send them in along with 4 or 5 bucks for S&H, and you get a special edition Stealth Ravavge. In very weird colors, and lots of Chrome bits, including the guns, and legs. Its not really that great, but is a great way to get people to buy figures. You need to spend at least 60 bucks to get a 12 dollar figure shipped to you. Even with the chrome that's a little too much. 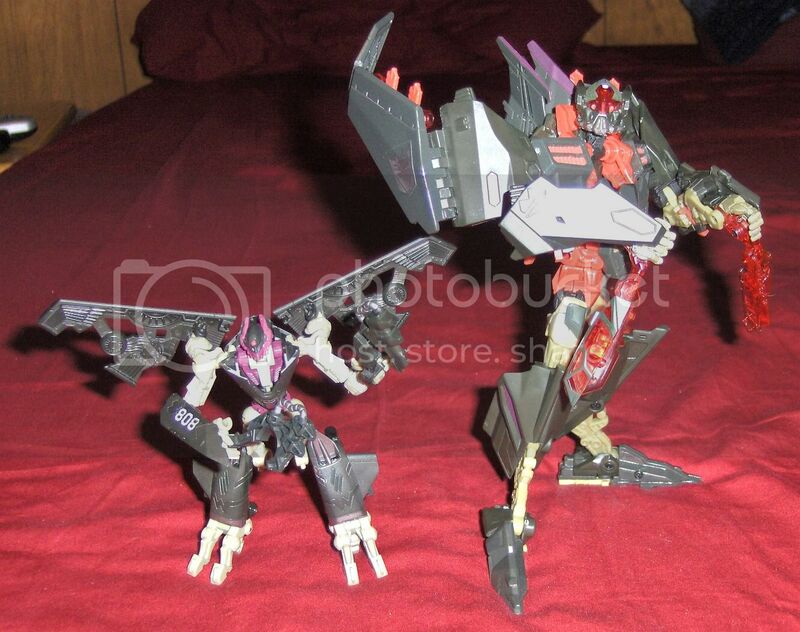 As far as Mindwipe goes, if only I could find him around here :( He's one of the few ROTF figs I like and wanted to buy, and yet no sign of him. I like Ravage in the movie, just not the Deluxe-class toy(s). And, to be fair, I was stunned at how early we got Mindwipe where I live, since WA State is usually months behind the rest of the country when it comes to in-store purchases. With the exception of various Optimus Primes for my Optimus Prime collection, and the leader and legends class Jetfires that can combine with the Primes, I've really avoided the Revenge of the Fallen line. But these two... they looked great and I had to have them, and I couldn't picture having one without the other.